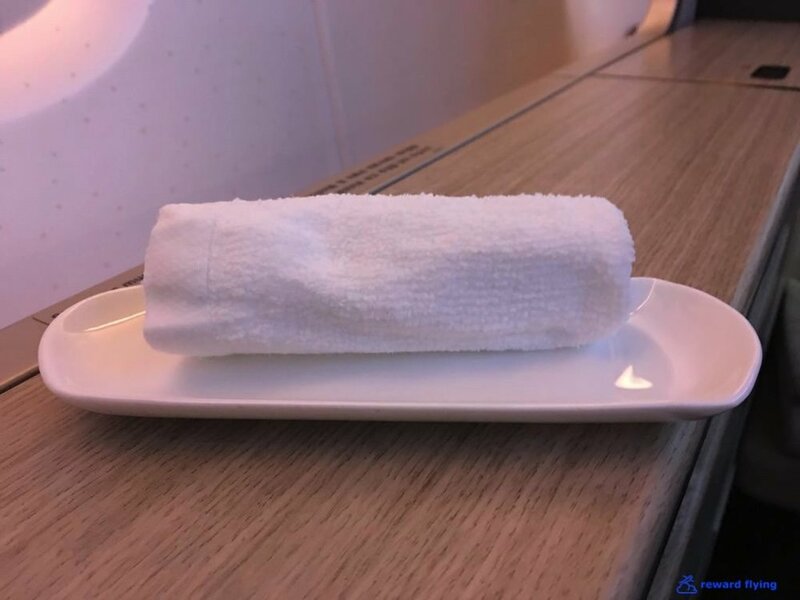 Early last year I ticketed an Asiana flight in first class on their A380 but subsequently downgraded myself to business class. The result was not one of my favorite in-flight experiences. So after booking this first class combo of LH and OZ to Seoul, buyer's remorse set in. I began to think it might be safer to just fly Lufthansa all the way. When I first booked this reward a Lufthansa leg to Seoul was available but after my consternations that availability was gone. So I set an alert on Expert Flyer to be notified if a seat came about. A few days later, about a week before departure, I received the alert. A seat was available. Decisions, decisions. On one hand it would be fun to compare the two first class products. On the other hand I wanted to fly Lufthansa's A380 and having great prior experiences on LH I had no reservations flying them all the way. What to do? I came within a mouse click of changing the flight. Am I glad I didn't. Why didn't I change? 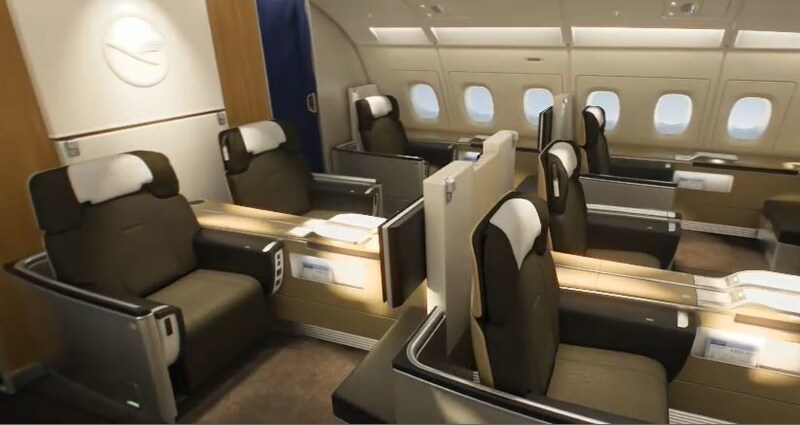 I compared the two seats using these two photos on Reward Flying's A380 blog. Knowing I'd be on my second consecutive overnight flight, I assumed sleep would be a priority. Which cabin looks more conducive for better sleep? A side bonus of taking the Asiana flight is it departed an hour later from Frankfurt than the LH flight. More time to spend in this best lounge in the world! Read about that here. But as I explain in the lounge report, I wouldn't be getting the Lufthansa first class ground services, meaning no private car service on the tarmac to the aircraft. I walked to gate B46. Things didn't look promising. It was crowded. And hectic. Nor could I get a photo of the aircraft. Then before I knew it I was on the aircraft, and in awe even if there were no roses in the entry. The first class cabin is on the lower deck which affords it a more spacious feeling. The cabin was immaculate. With 12 enclosed suites the cabin seemed far more private than the open 8 suite cabin of Lufthansa. In fact it was so private I couldn't tell you how many suites were occupied. My guess is 11. Is the Lufthansa cabin more aesthetically pleasing? Yes. Privacy has it's price. The two center seats can be completely closed off with the retractable divider, otherwise they're perfect for couples. Window suites have a little extra room because of the air vents along the wall. The photo above shows the ottoman that has storage below. The storage area is not as tall as others like Cathay Pacific. And since they wisely chose not to put overhead bins in the cabin, the storage closet at the entrance accommodates the balance of luggage requests. Windows seats in row 1 and 2 have two windows while row 3 has three windows. This is the extra one. I remain in the negative camp concerning A380 windows. Neatly placed on each ottoman were a number of amenity items. A very large blanket with another pillow for the bed, headphones and a Salvatore Ferragamo amenity kit. Soon every flight attendant servicing the front cabin, as well as the purser, came by to introduce themselves. A lovely woman named Kwon would be my primary attendant. It must have been my lucky day. She was attentive, pleasant and had a smile every time she appeared. She also spoke fluent english. Her first question would be what size pajamas I'd like. I requested XL based on the response she gave when I inquired how they sized. Immediately she returned with this beautiful silver bag. Inside were top of the line pajamas. These are as good as any I've ever gotten. Off to change. The lavatory has a most interesting design. It was narrow but long. On each end were vanity mirrors with one side having a sink. Between the mirrors along the wall was a bench . The bench had a lid at one end which when raised was the toilet. So you could sit and use the mirrors on either side and there was ample room to change. For that matter you could take a nap. The lavs were well stocked and kept immaculate during the flight. Interestingly however, the upstairs lavatory in the front business cabin is a bit larger than this one if memory serves. There were plenty of refreshing misters, lotions, shaving supplies and cloth hand towels. Back at the seat I took a look at the handsome Salvatore Ferragamo amenity kit. grey slippers. Maybe it's fashionable color combo, I don't know. High quality headphones rounded out the amenity list. Of course I was offered an adult beverage before departure but declined ceding to simple water. An prior overnight flight followed by a couple glasses of wine at the lounge had me wanting to pace myself as a result of that age thing. Kwon offered an oshibori. 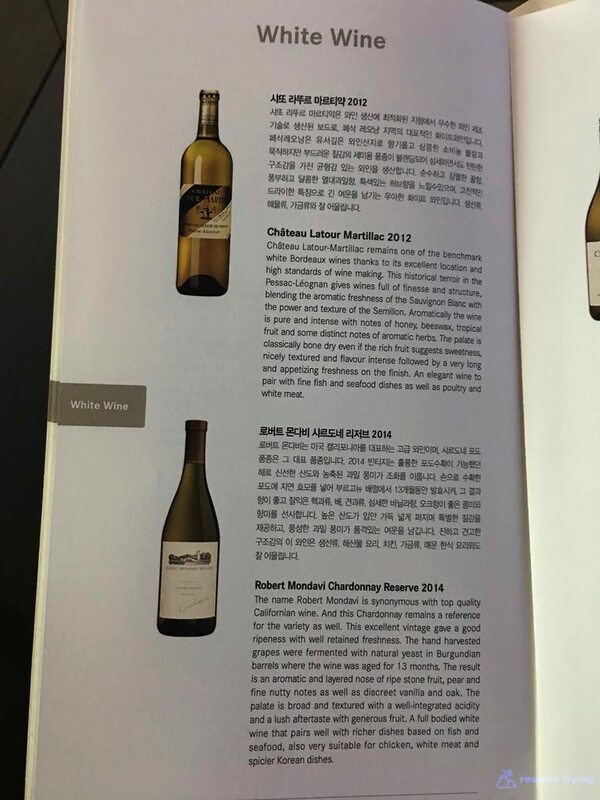 The Asiana first class wine list was presented. Two champagnes were offered; Laurent Perrier Brut and Barons de Rothschild Blanc de Blancs with the later being the more expensive. Maybe not up to Lufthansa standards but I can't personally attest to taste as I went for my usual. 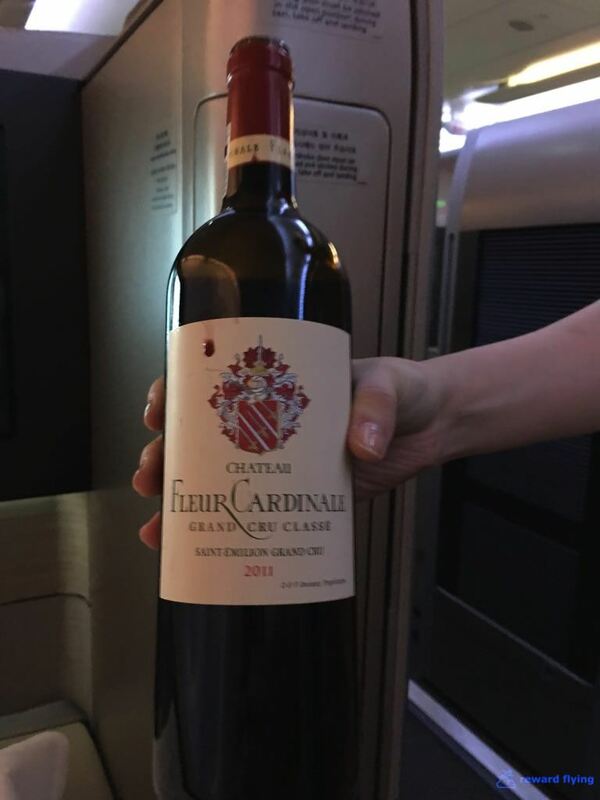 Note, they had a white Bordeaux on board from the same Chateau Latour Martillac that aged the Cru Classe coming in on LH. A creature of habit I went for the Château Fleur Cardinale Grand Cru Classe. I was content. It was a nice wine. Apparently it sells for around $50 a bottle. Here's Kwon. As you can tell she wanted no part of a photo so I will respect her wishes. She was too nice to do otherwise. You have to love how she came armed with a basket of your favorite beverages along with champagne, just in case! Dinner offerings were Korean and Western selections. Normally I prefer to try the native cuisine of the airlines I'm flying, but the last round of Bibimbap wasn't to my liking and stewed seafood wasn't inspiring or even something to consider. Notice the asterisk. I'm pleased to accept. I was more interested in the Western menu tonight. A Western option with a German flair, perfect. Sauerbraten it is! An Amuse or Starter was served first. While presentation may lack, the impending result wasn't all that bad. A better serving dish would have done the trick most likely. The table is set, the rose in place. Time to eat. Caviar, round two, without the flight attendant editorial. A very nice presentation, don't you think? I don't have two waters. Kwon insisted I have a chilled vodka with my caviar. Her pour was generous, to put it mildly . A beautiful salad was presented next. Time for the main course. Beef on a plane. Should I close my eyes? Perfect. It wasn't pot roast or stew meat like Sauerbraten usually is. This was tenderloin. I thoroughly enjoyed this meal. Maybe a little over-sauced but the caramelized pear and sauerkraut added a nice sweet/sour contrast. The potato pancake was well executed. The presentation was nice and while I've only got a sliver of German blood, I'm sure a true German would have approved. Having eaten too much considering the Wiener Schnitzel along with not telling# desserts in Frankfurt and now this delicious meal, I passed on cheese. But who could resist the Amaretto Mascarpone Tart. Not me, not enough will power, fortunately. This meal blew away Lufthansa's offering the night before at every turn. Was it gourmet? No, just good food. Before making the bed let's have a look at the seat. Some reviews have stated the dislike for Asiana's seat color choice. It might not be the best but I find it unobtrusive. It's just rather plain as is the cabin itself. This tablet control pad is used to manipulate the seat. 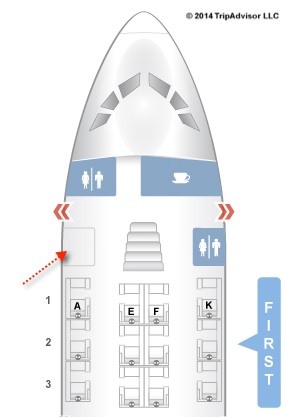 The IFE system controller must be used and is located in a compartment on the armrest opposite side of entry. The monitor is massive and provides a high quality picture. 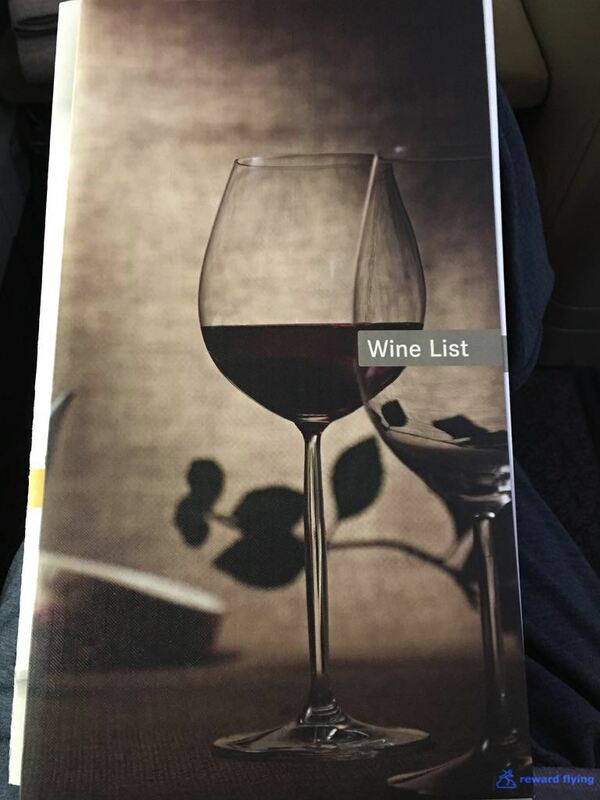 Content, something Asiana is known to be lacking, at least for me was reasonable on this flight. I found a movie (Bourne something..) and tv series (House of Cards) to watch. There were plenty of storage containers on the side wall with latched lids. The closest one to the seat contained the audio jack as well as a USB charging port. This lid would also close even with your device plugged in. Below the ottoman down by the floor are the electrical plugs. Maybe an odd place for them. If you needed to work you could fit your office desktop computer on the tray. Each pod has its own closet with hanger. You can tell much thought went into designing Asiana's first class suites.There's plenty of useful storage while the space is uncluttered and everything is within reach while sitting in your seat. Somewhere over Russia at 1:05 AM local time. I asked Kwon to prepare the bed. As you can see the armrests can be lowered providing more bed width. It was quite comfortable and I was anticipating a good sleep. But it wasn't to be. Not because of the bed. It occurred to me that I was trying to sleep when my body clock was in the middle of Chicago's daytime. So I happily watched some tv and discovered something annoying about these enclosed pods. The pod is enclosed but only up to about average height shoulder level. Because of this you're subject to light changes from above. In my case the person sitting in front of me was watching something. So each time the picture changed, my lighting changed. The constant light changes became rather annoying. Plus row 3 had some galley noise. So unless you want to wear an eye mask, I recommend you get row 1 which has no distractions. I did not partake in any of the "refreshments" available. Ninety minutes before arrival the cabin lights came on and breakfast was served. Granted, the salmon with tomato basil sauce looks, well a little over sauced. Being over-sauced is alright, when the sauce is good! Looks aside this was a tasty breakfast and a pleasant surprise having two excellent meals on Asiana. One of the nice features on an Airbus A380s are the outside cameras. Unfortunately the weather in Seoul was densely overcast on arrival. It wasn't until an altitude of a few hundred feet before you could see anything. ✔︎Main deck A380, spacious and private. ✔︎Kwon was one of the best FA's I've ever had. She spoke great english as well. ✔︎A380, I definitely prefer the cabin on the lower deck as it is more spacious. Based on the A380 business class experience last year I was skeptical. That skepticism has been replaced with confidence. Confident I want to fly Asiana's A380 in first class again sometime soon. 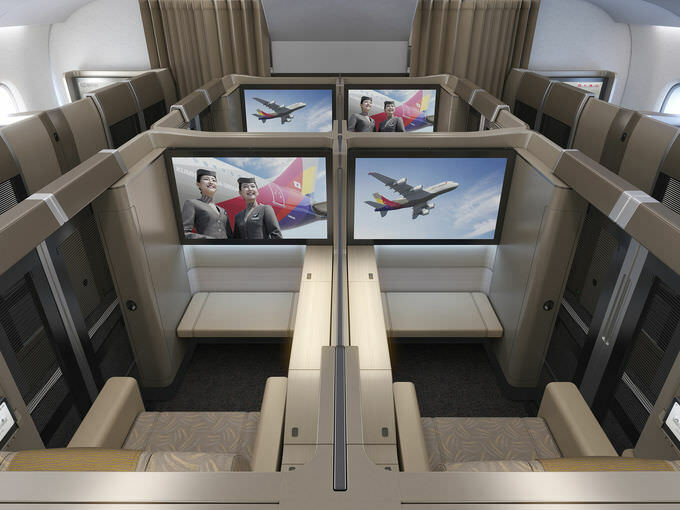 Do you have any experiences on Asiana you'd like to share? Feel free to leave a comment.